Ameraucana is an American breed that is bred to product blue eggs. The Ameraucana breed is one of the few breeds that lay blue eggs which most people love. Males tend to weigh around 6 lbs and Females weigh around 5 lbs. Other traits of this breed also include muffs, beards, pea comb, white skin and full tails. 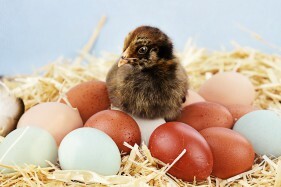 They are known to have a good egg production rate and should produce eggs if the environment is correct. Stop by Ark Country Store during chick days to purchase your Amerauacana chick and collect everything you need to raise a healthy flock this year. This entry was posted on Wednesday, February 3rd, 2016 at 10:56 am	and is filed under Uncategorized. You can follow any responses to this entry through the RSS 2.0 feed. Both comments and pings are currently closed.